How do you get voted on to the School Council? Learner Voice is an important aspect of the work we do at Lliswerry High School. We regularly undertake questionnaires to make sure we listen to the views of learners. School Council is a key voice that helps us develop our school together. The process to become a member of the School Council is a democratic one which starts at form level when you get elected by your peers to represent them on the Year Council. After that, each year representative votes for 2 learners to represent their year on the full Student Council. The School Council meets every half term to discuss a number of issues, policies, rules, or general matters concerning our school, which is then fed back to the learners in the forms so they are made aware and are kept informed. 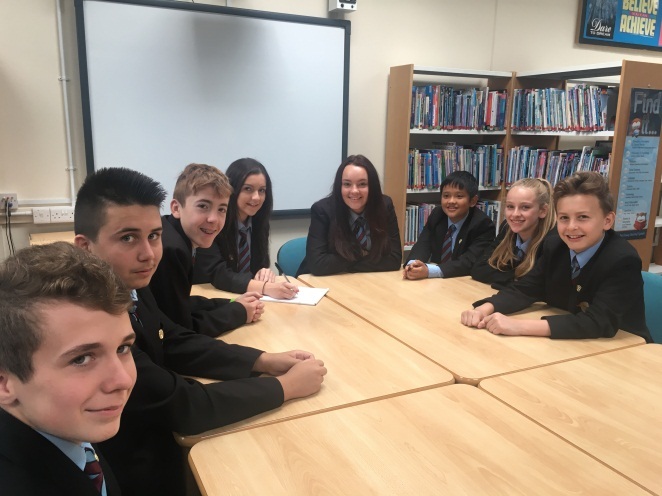 Members of the School Council are invited to meet with the Headteacher, Mrs Mills, and her senior leadership team (SLT) to discuss all of the issues discussed at council meetings. What has the School Council been involved in this year (2015-16)? Learners said: The choice of food in the canteen did not suit everyone. The food in the canteen is expensive. Some learners were handling the food and then replacing it and not purchasing it. The queuing in the canteens allowed learners to push in. School Council Actions: A meeting with the catering manager was organised to discuss the issues raised. The school council met with the catering manager, Mrs Cammies, and her deputy, Karen, to ask them a number of questions regarding things such as variety and cost of food on offer. It was also an opportunity to share their views on how things could run even more smoothly during break and lunchtimes. Outcome: As a result, some things that have been changed are an increase in meal deals, glass in front of the food to prevent learners simply taking items and the purchase of more robust barriers to aid the queuing process. Learners said: The corridor and classroom rules need reviewing. School Council Actions: A meeting with Mr Coughlin was organised to discuss this. Outcome: The learners have been instrumental in taking the lead on the design and wording of the new school corridor and classroom rules to replace the old ones.These are now in place in all classrooms and around the school. Learners said: The girls complained that the boys’ toilets had been refurbished but not the girls’. School Council Actions: When funding to refurbish toilets became available, discussions took place to involve learners in the project. Outcome: Key Stage 3 council members and some form representatives went to two Newport schools to look at their facilities. These schools operate an open plan system with both males and females using the same area. It was very interesting and helpful and our learners took on board what the learners said from the other schools and fed back their suggestions to SLT. The toilet refurbishment starts for the girls at the end of July 2016 and the design of the mirrors was suggested following the visit to the other schools. When funding becomes available the project will be completed with the boys’ side being refurbished. Learners said: Key Stage 4 learners requested to be able to eat in the link corridor. School Council Actions: A meeting with Mrs Mills and the Senior Leadership Team was held to discuss the request. Outcome: Eating in the Link corridor for Key Stage 4 learners has been allowed after it was debated very well by learners on the council to members of SLT. As you can see from the actions that have resulted from the above, Lliswerry High School places great importance on listening to learner voice in the school. To be a Form or Year representative is very important and to be voted onto the full School Council ensures that your voice will get heard and you will be involved in making important decisions to improve your school.